LONDON, April 15 (Reuters) – At least five merchant vessels carrying food are stuck off Yemen as warships from a Saudi-led coalition search them for weapons bound for Iran-allied Houthi rebel forces, with delays adding to a humanitarian crisis. Yemen imports more than 90 percent of its food, including most of its wheat and all its rice, to feed a population of 25 million. Much of its needs had been serviced by foreign ships, although shipping lines have now reduced or stopped port calls. Ship tracking data showed at least five cargo ships were anchored off Yemen unable to enter Yemeni waters. Saudi Arabia and Arab allies have launched air strikes against Houthi rebels, who have taken most of the country and forced President Abd-Rabbu Mansour Hadi to flee to Riyadh. The coalition has deployed naval vessels to intercept ships carrying arms to the rebels, although merchant ships are meant to have free passage once they are inspected. Nonetheless, this has already meant delays for food deliveries by sea. “It is more difficult now to find ship owners willing to provide vessels and you face your shipment being held up for an unknown amount of time by warships before even bringing it into Yemen,” one international food trader said. A cargo vessel, the Lycavitos, carrying 47,250 tonnes of wheat, waited outside Yemeni waters for nearly a week before Egypt’s navy on Tuesday cleared it to sail to al-Saleef port, the ship owner’s agent said. 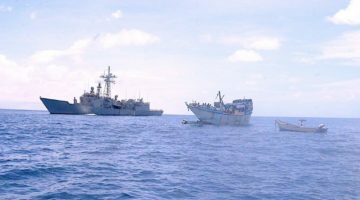 “Even after clearance was given, as the vessel approached Yemeni waters it was approached by another coalition warship asking what it was doing in the area before the captain clarified it had clearance to enter,” Helikon Shipping Enterprises Ltd said. Saleef is close to the bigger Red Sea port of Hodaida, which is controlled by Houthis. The impact of the delays is likely to add to growing logistical problems with the delivery of food. The U.N. Food and Agriculture Organisation warned on Wednesday that with a rapid escalation of the conflict “the food security situation is expected to deteriorate significantly”, with food reserves shrinking. The Hayel Saeed Anam Group, which owns the Yemen Company for Flour Mills and Silos, said it had allocated flour from its mills in Hodaida especially for Aden – the scene of heavy fighting – because of “severe suffering” there. The company called on all sides not to attack trucks carrying in the flour. In another example of the difficulties, a container ship, the Andre Rickmers, was initially unable to discharge at Hodaida for safety reasons, but then it was stopped because coalition naval forces were not allowing entry to Yemeni ports, the vessel’s owner said. The vessel drifted outside Yemeni waters for a few days before being ordered back to the port of Jeddah, a spokeswoman for owner Rickmers Group said. Yemen’s Foreign Minister Reyad Yassin Abdulla told Reuters on Tuesday: “All ships should have permission from the coalition forces before entering Yemeni waters. Shipping associations said the maritime zones had not been clearly defined and they were seeking clarity. “All vessels are advised to transit the Gulf of Aden and Red Sea outside Yemeni territorial waters, 12 nautical miles, where possible,” the world’s largest shipping association, BIMCO, said. On Tuesday, the U.N. Security Council imposed an arms embargo targeting Houthis.